Media - Press Releases; News Announcements etc. February 16, 2016: - Senator the Honourable Paula Gopee-Scoon, Minister of Trade and Industry, along with senior officials of the Ministry, met with key stakeholders in the local yachting industry on Friday 12th February, 2016. The Trade Minister Gopee-Scoon noted that the purpose of the meeting was to ‘identify what was involved in the sector [and to seek] proposals from all of you around the table … for Government needs to know how we can help’; noting that ‘the first step is to do everything that we can do to get the ship repair capacity back to its original state’. The thoughts expressed by the industry stakeholders included the words that ‘the industry simply requires facilitation’, ‘the cluster created in Chaguaramas is world class’ and ‘the yachting industry is an export-led sector’. The meeting also dealt with the issues of security on the seas for cruisers; the deleterious effects of the imposition of VAT on yachting services; and a proposed single harmonized form. Ideas on opportunities for the sector were also outlined. Representing stakeholders were the key players, including Power Boats Mutual Limited; Budget Marine Limited; Members Only Taxi Services; Peakes Yacht Services; Coral Cove Marina Marina; CrewsInn Marina; Soca Sails Limited; Yacht Maintenance Services Limited; Yachting Steering Committee; Yacht Services Association of Trinidad and Tobago; and Trinidad and Tobago Sailing Association. Also present at the meeting were Mr. Norris Herbert, Permanent Secretary (Ag. 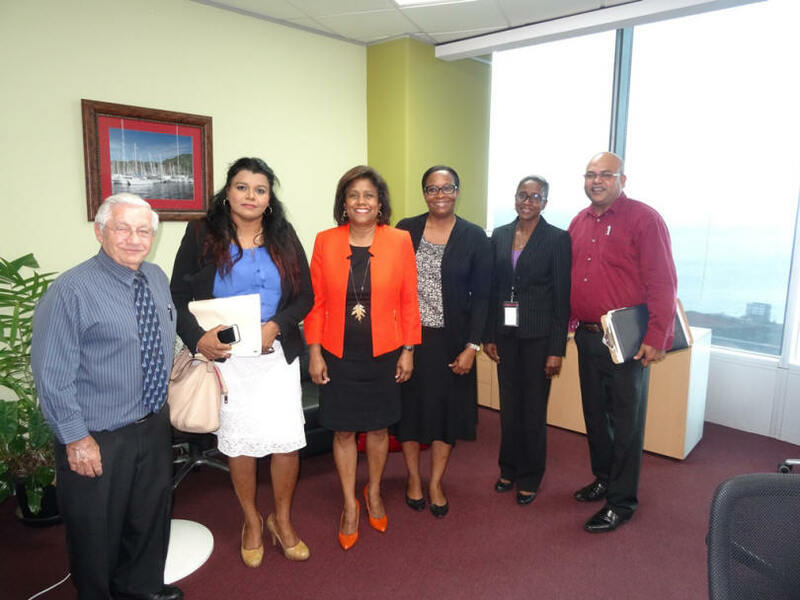 ), Ministry of Trade and Industry (MTI); Ms. Karlene Roach, Deputy Permanent Secretary, MTI; Mrs. Susan Singh-Seerattan, Senior Economist, Business Development, MTI; Mr. Randall Karim, Director, Policy and Strategy, MTI; Mrs. Yolande Agard-Simmons, Manager, Corporate Communications, MTI; Ms. Victoria Wharton-Lake, Advisor to the Honourable Minister; Ms. Abigail Edwards, Business Facilitator, Business Development, MTI; and Ms. Stacey Honore, Business Facilitator, Business Development, MTI. About 10.30 today April 14th, Sylph, a 55 ft Beneteau sail boat positioned about 15 nm NE of the Hibiscus oil platform was approached by a group of 8 Venezuelans in an attempted piracy attack. The Yacht refused to stop and in heavy seas and high wind took an evasive zig zag course preventing them from boarding. Due to the fact that they were unable to board they abandoned their plans and left but fired several shots at the sailboat. No one on board was injured , the boat suffered several bullet holes. Sylph is now in Port Louis Grenada meeting with the Coast Guard and officials. TTCG is in contact with the Grenada CG and will be meeting With YSATT tomorrow. As further details become available we will keep everyone informed. Meanwhile : Please FILE A FLOAT PLAN with the TTCG and call North Post Radio station if you are traveling in or out of Trinidad. Travel in a convoy if possible. We would like to thank all for their concern and best wishes relating to our recent incident. Firstly, we would like to thank the Grenadian Authorities, along with Port Louis Marina and Tyrrel Bay Marina for their concern and professionalism shown to us. We urge all persons to stick to the facts and not add there personal negative opinions to the event which due to social media can have devasting effects to Trinidad’s Yachting Industry. We also would like all parties to be aware that our yacht will be travelling back to Trinidad for repairs as we have confidence in both the increased patrols by the TTCG and the procedures which are in place to ensure a safe passage. Our yacht has always had repairs and upkeep done by some of the best marine professionals which are based in Chaguaramas, Trinidad and we will continue to do so.